Who was Henry Standing Bear? Henry Standing Bear was an Oglala Lakota Chief who invited sculptor Korczak Ziolkowski to carve a memorial honoring all North American Indians. How do I pronounce Korczak Ziolkowski? Korczak Ziolkowski [core-chalk jewel-cuff-ski] is the sculptor of Crazy Horse. What year did Korczak Ziolkowski come to the Black Hills? 1939 – Korczak Ziolkowski, a noted New England sculptor, first came to the Black Hills to help Gutzon Borglum on Mount Rushmore. That year, Korczak also won first prize for his Carrara marble portrait, “PADEREWSKI, Study of an Immortal,” at the New York World’s Fair. 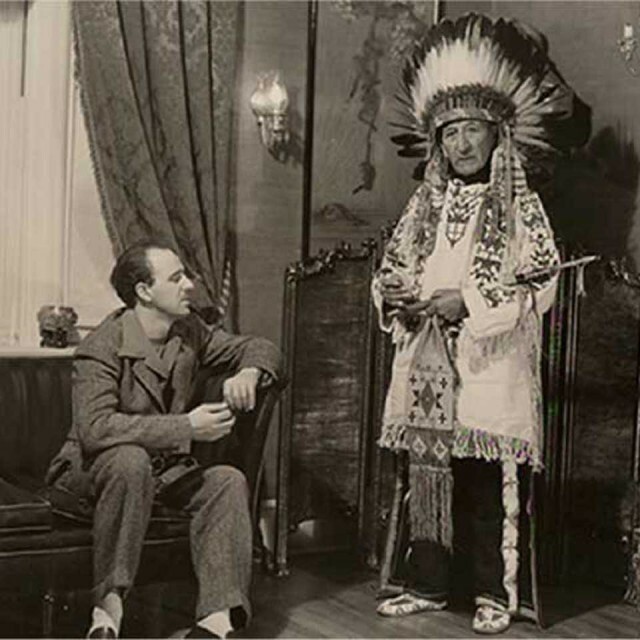 Chief Standing Bear read news reports of Korczak’s achievements and invited him to create a mountainous tribute to the North American Indians. When did Korczak officially return to start the monument? May 3, 1947 Korczak Ziolkowski returned to the sacred Black Hills to create a monument of Crazy Horse. He came at the invitation of Chief Henry Standing Bear. When was the first blast on the Mountain? June 3, 1948 – First blast on the Mountain. Five survivors of the Battle of the Little Bighorn attended. What is the Memorial's mission? The mission of ©Crazy Horse Memorial Foundation is to protect and preserve the culture, tradition and living heritage of the North American Indians. The Foundation demonstrates its commitment to this endeavor by continuing the progress on the world’s largest sculptural undertaking by carving a Memorial of Lakota leader Crazy Horse; by providing educational and cultural programming; by acting as a repository for American Indian artifacts, arts and crafts through THE INDIAN MUSEUM OF NORTH AMERICA® and THE NATIVE AMERICAN EDUCATIONAL AND CULTURAL CENTER®; and by establishing and operating THE INDIAN UNIVERSITY OF NORTH AMERICA® and, when practical, a medical training center for American Indians. What are the mineral components of the Mountain? Crazy Horse Memorial® is being carved in the Black Hills, which are among the earth’s oldest geological formations. All the individual mineral, rock and gemstones found on the Mountain form what is called pegmatite granite. Tourmaline- a group of several closely related minerals, which is black in color. Iron (Oxidized)- a chemical compound composed of iron and oxygen, also known as rust. Garnet- a group of minerals which form a gemstone red in color. Feldspar- a group of rock minerals that make up 60% of the Earth’s crust, often pink or white in color and chalky in texture. Quartz- a very common mineral which occurs in nearly all mineral environments. Mica (Muscovite)- a group of minerals forming thin transparent layers and well known for its shine, glitter, and sparkle. It is often found in granite rock and slate. Beryl- a mineral composite with gemstone varieties including emerald. The beryl on the Mountain is a greenish- yellow color variety. Pyrite (Fool’s Gold)- a brass-yellow mineral with a metallic luster. 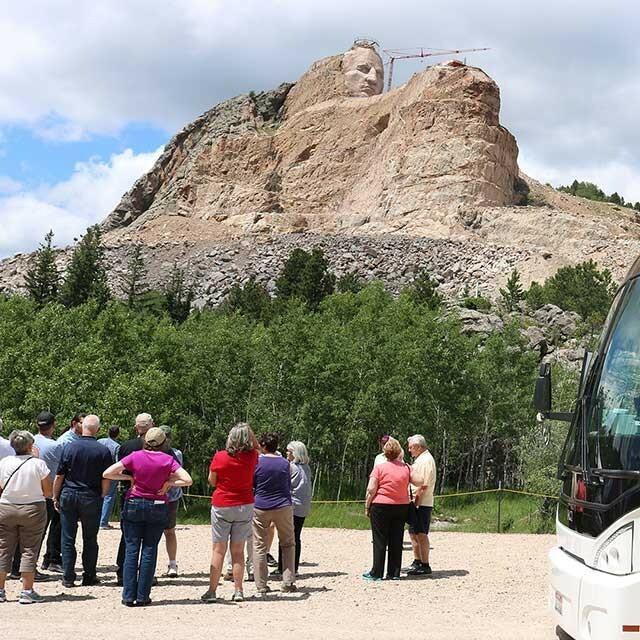 How many visitors come to Crazy Horse? The Crazy Horse Memorial® complex is open year-round and work continues on the Mountain throughout the year! 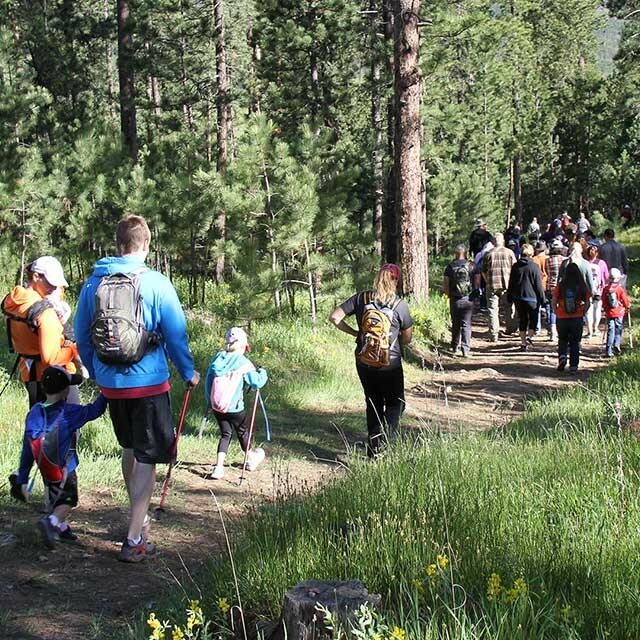 We are proud to host over ONE MILLION visitors per year! How is the Memorial financed? The Memorial is financed by admissions and contributions and does not accept federal or state funding. Read the biography of the original dreamer.